where you just need a time out. I’ve been looking for a place. I need a place where I can sit when I need to shut out whatever is chasing me. So I have started interviewing churches to see if any one of these lovely buildings has what I am looking for. It’s a longshot because I am not really sure what I am looking for, but I thought maybe I would line up the things that appeal to me in churches to see what my place looks like, at least. 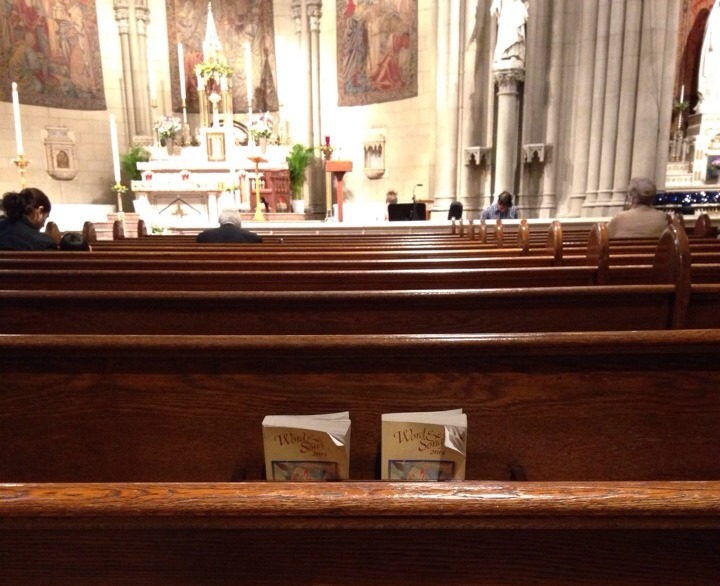 These were taken at Blessed Sacrament Church on the Upper West Side of Manhattan. It’s a 1920’s jewel box of a church, designed by an architect with a degree from Columbia University, who fashioned the upper gallery after La Sainte Chapelle in Paris. Like the very best Gothic churches, this one soars. You sit on that wonderful warm wood and you can’t help but look up and that lightens me. 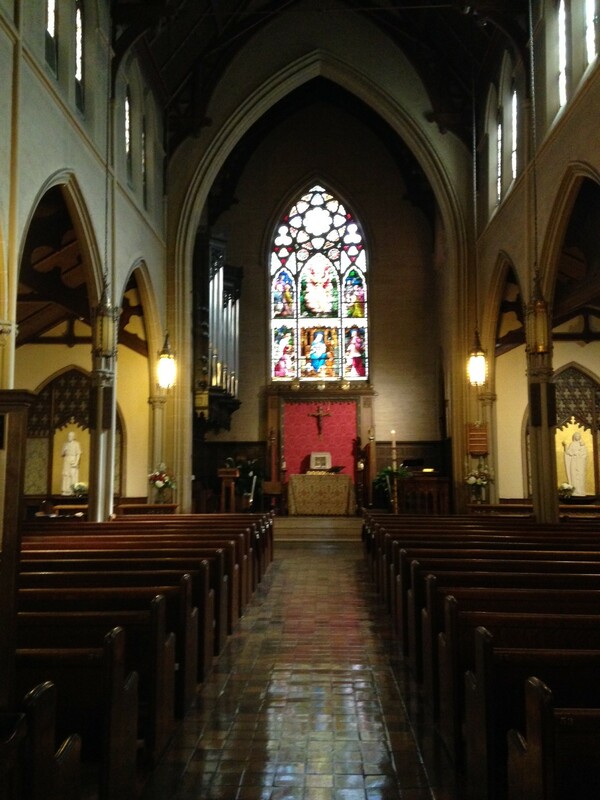 This historic Michigan church is where I was baptized, where I made my First Communion, where I was confirmed – it will always be sanctuary. 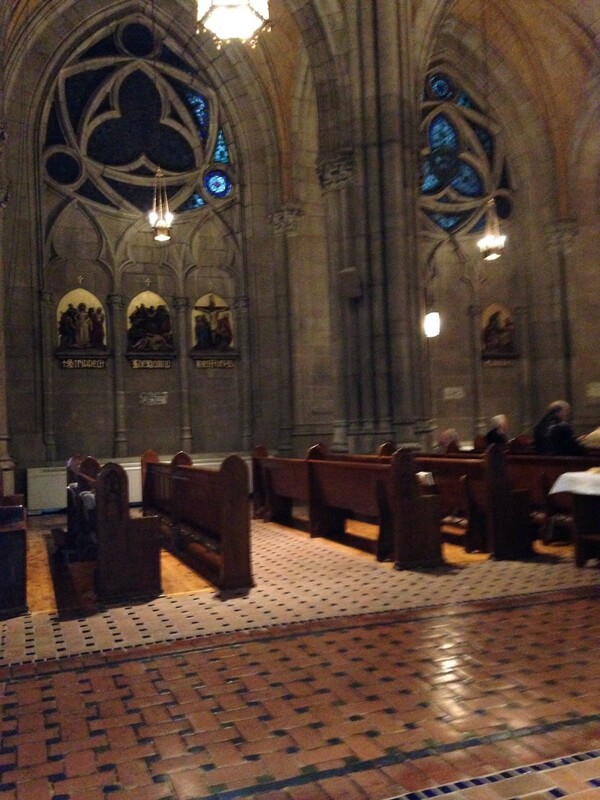 But the difference here is that I am surrounded by ghosts in this church. I find it hard to concentrate because I look up to the gallery and remember singing in the choir, or I look at the statue of Mary wearing the May flower crown and a handful of grade school May processions surround me. 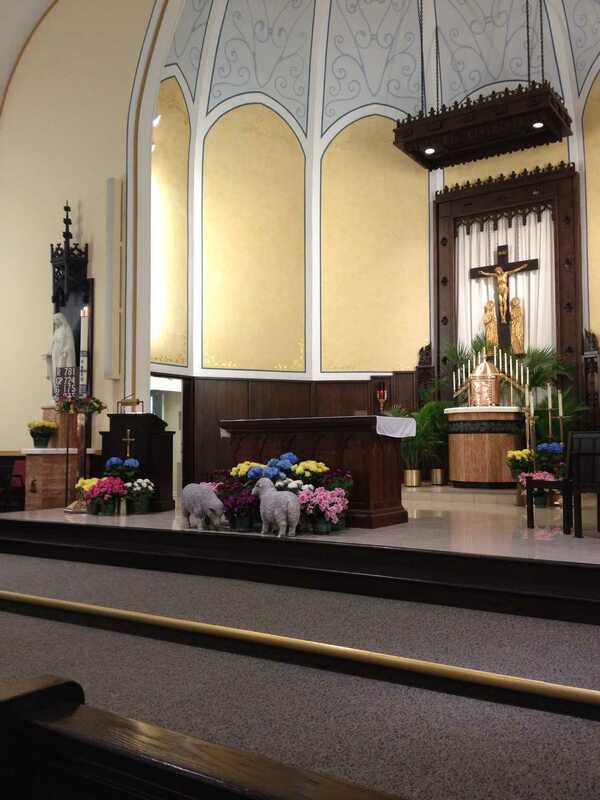 The parish itself goes back to the first French missionaries who came to convert the Pottawattamie and Miami tribes in this area of the north central Midwest. Sometimes it’s just a detail that provides me with the calm or the solitude or the cover I need. 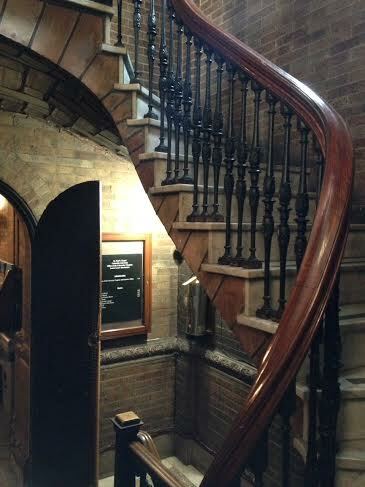 This stunning staircase is one of a pair in St. Paul’s Chapel at Columbia. The tiles are by the Guastavino tile factory which provided a clever medieval solution to decorating with brick. 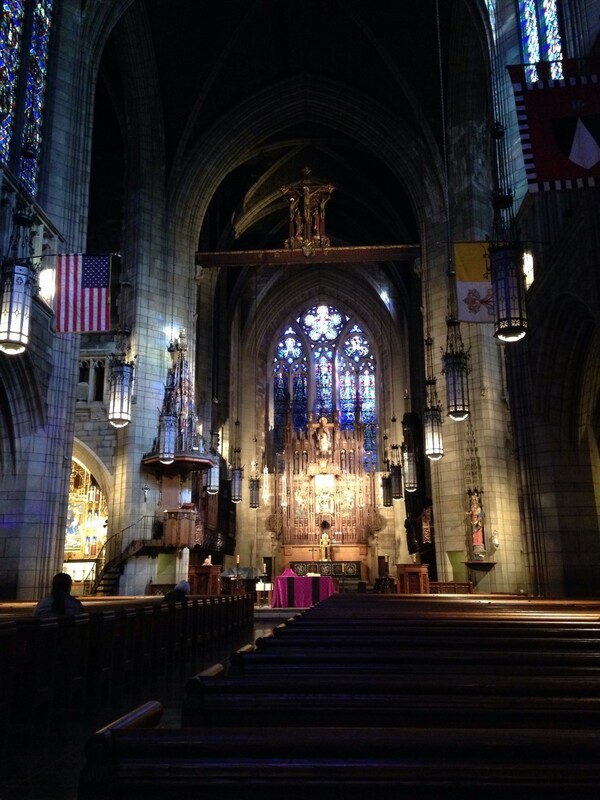 And sometimes it’s the fabulous stained glass that lends the feeling of calm, of comfort, of mercy when I need it, like here at the Church of St. Thomas More on the Upper East Side. 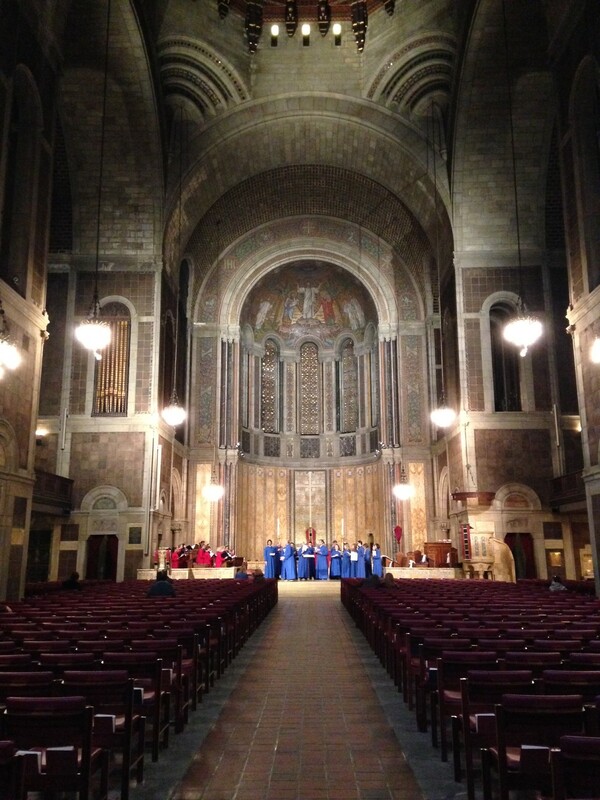 We are so fortunate in New York to have such a vast variety of holy spaces – even when they are under construction, you can find sometimes, just what you are looking for. Even if you can’t put your finger on it. 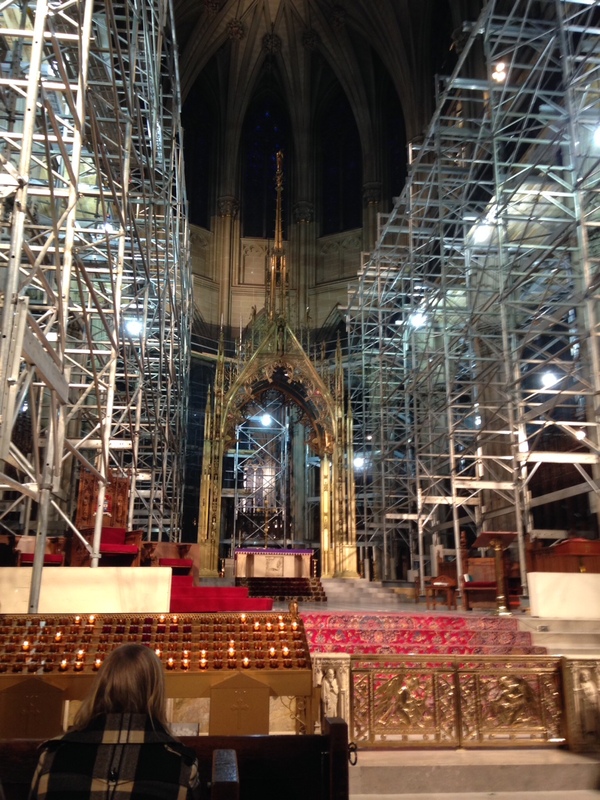 St. Patrick’s Cathedral is in the middle of a very serious renovation, both inside and out. Another jewel box is this very solemn, very serious St. Vincent Ferrer, just south of Hunter College. This is one of the few places where I focus on a particular thing when come in and sit down, when I want to slow down and get into better focus – it’s that wonderful reredos, the wood screen in the back of the altar. 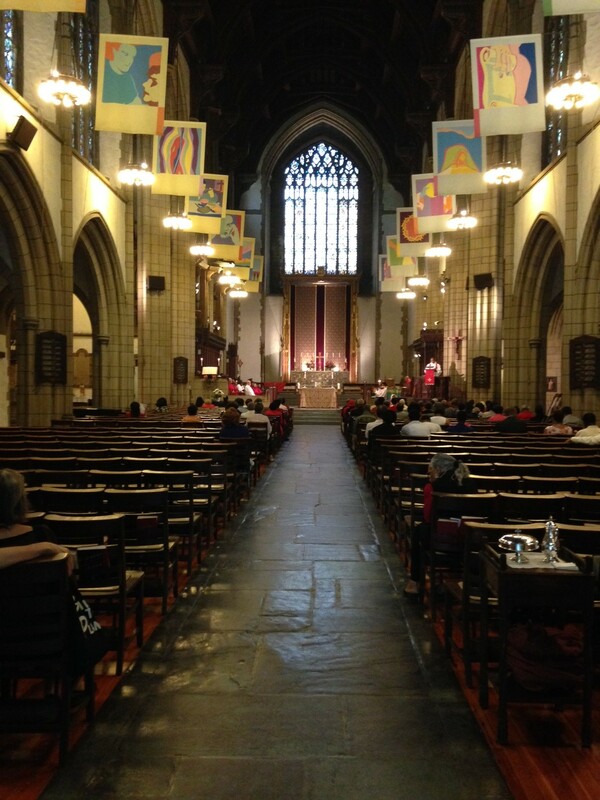 Some New York churches are very large, like St. Bartholomew on Park Avenue. It is remarkably consoling, extending a very gracious welcome to me every time I go there. This photo was taken on Holy Saturday when I just needed to drop out of sight for 10 minutes. The banners, the stone and wood floors, the system of arched openings, and the glass backdrop make this a place to examine at some length. I am fascinated by the interplay of surfaces and the way they feel when you touch them – the stone is cold, the wood warmer, and the smell of the thin paper and ink in the prayer books make for a more sensory experience here. That’s the thing about the fancy places – they have so many different materials and important items that taking the inventory can be more distracting than anything. And then, there is that one place that sets the bar for every other place. 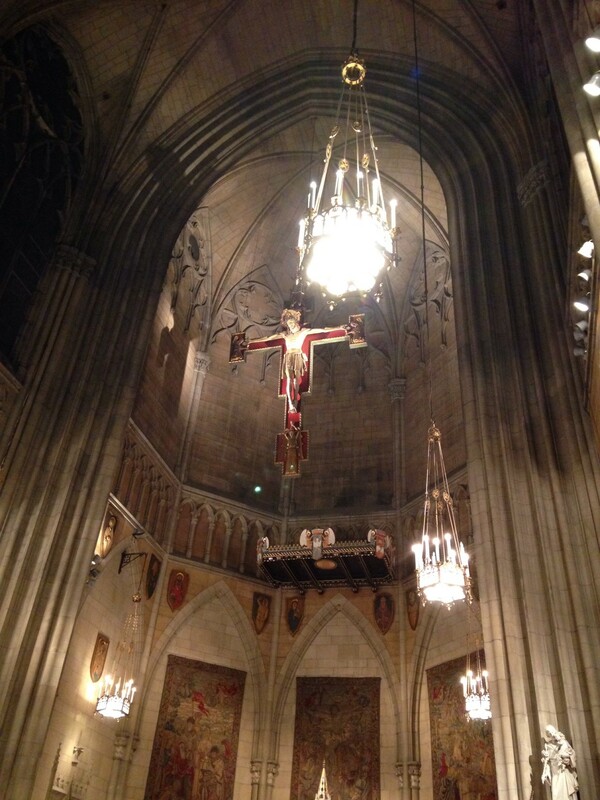 For me, it is a cathedral in Spain that I would visit every day if I could. I step in and can feel its history. St. Francis of Assisi came here and left his walking staff. It’s part of one of the columns up front. And the remains of the Apostle James are housed here in the crypt. 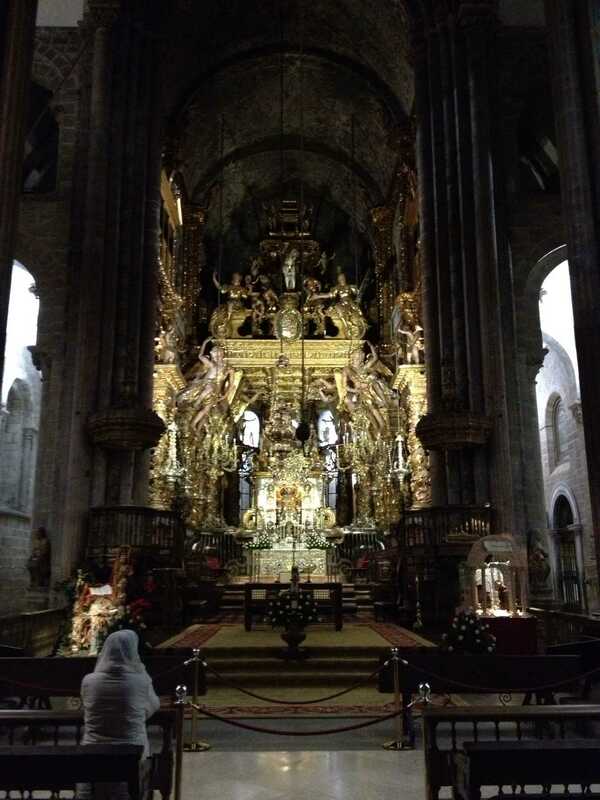 It is the focus of over a thousand years of pilgrimage across northern Spain to the city of Santiago de Compostela where I attended a Mass in the evening where I saw the woman with the white mantilla. 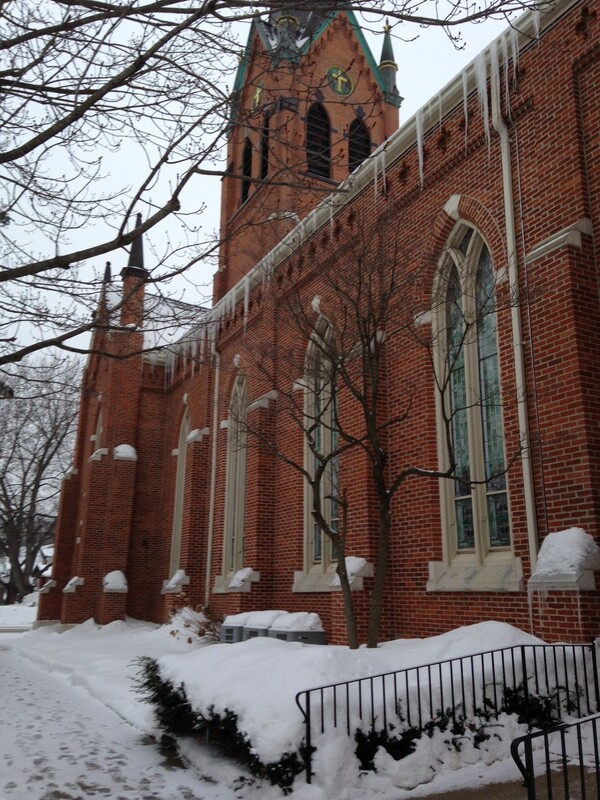 But since I am describing churches, I feel obligated to identify my favorite. 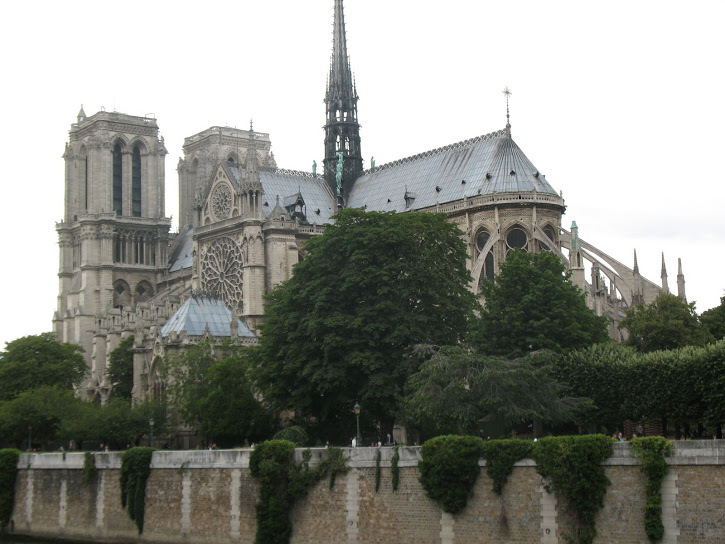 I come back to this church whenever I am in Paris and it’s always the same. I walk in and up the side, with tourists and visitors from all over the world and I feel like it’s my church and they are just looking. I get this place. And I think it gets me. The rumor is that if you are a political refugee or criminal, you can run into a church and claim sanctuary so the long arm of the law – if it finds you at all – will find you just out of reach. You can’t leave, of course, but you can’t be taken either. I think that’s comforting. I keep that in the back of my mind. If I am on the lam, I will look for a church. One with a nice bathroom and air conditioning in July and August. In the meanwhile, even though I can’t really say what it is I am looking for, I am finding it in these beautiful spaces.